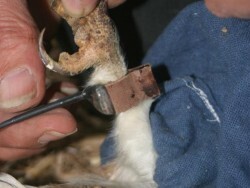 This photo gallery shows three methods used for attaching conventional radio tags to Barn Owls. 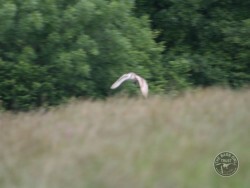 The latest radio tags have the potential to significantly increase our understanding of Barn Owl dispersal, ranging, and foraging behaviour, although currently, due to the limitations of battery life, significantly large studies are very expensive. However, tag technology and battery technology are advancing very quickly. 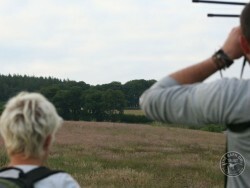 This study by Birdwatch Ireland is fantastic example of what can be achieved. 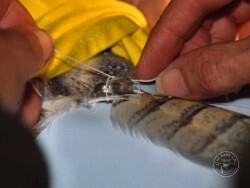 Short-term Barn Owl tagging: Radio tags that are attached to the owl’s feathers and tags that are glued directly to the skin usually become unattached (and often lost) within a week or two and are only used for short-term tagging. 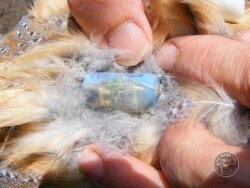 Longer term Barn Owl tagging: The two long-duration ways of tagging Barn Owls (whether conventional radio tags or GPS tags) are the ‘back pack’ or ‘harness’ method (for young in the nest at 6-7.5 weeks old) and the ankle-mount method for fully-fledged birds. 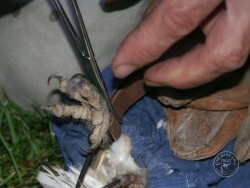 Tail-mount 1: prepare a central tail feather. 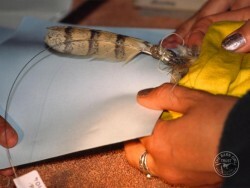 Tail mount 2: tie and glue the tag to the feather. 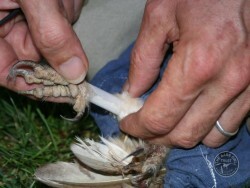 Tail mount 3: then tie it to the next feather as well. 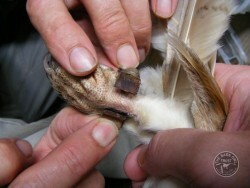 Tail mount 4: after about 2 weeks the the tag comes off when the feathers moult. Back mount 1: radio tag attached by 2 teflon ribbons. 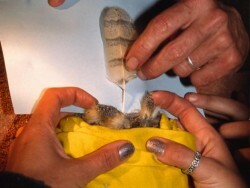 Back mount 2: Only fledgelings are tagged in this way. 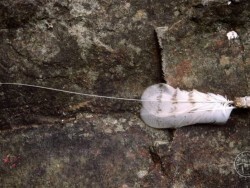 Back mount 3: months later and no sign of abrasion – bird alive and well. Back mount 4: breast strap has not caused any abrasion either. Ankle mount 1: ankle protected by plastic sheath. Ankle mount 2: leather strap superglued. Ankle mount 3: strap clamped while glue dries. Ankle mount 4: sheath removed and leather trimmed. 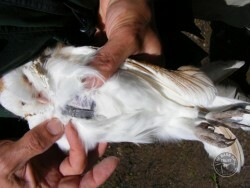 Luckily for us, this radio-tagged male often hunted in daylight. You can see the antenna of the ankle tag sticking upwards. 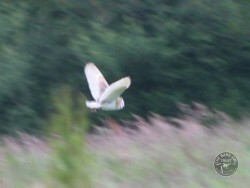 Moments later he was carrying prey back to the nest – unaffected by the tag. Most radio tracking takes place at night using 2 teams in radio contact. 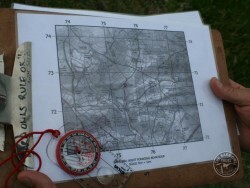 Positions, bearings, and times of all ‘fixes’ are recorded. Months later and the tag is removed. 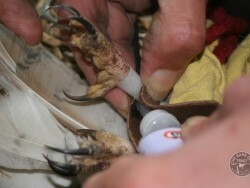 The owl’s ankle is still perfect..
More about GPS tagging Barn Owls.